Everything in this world has balance. For every good moment, there's a moment that's lower to help keep perspective on the exhilaration of the highs and not to let the lows get too low. Tonight, the NHL's Central Division saw a little yin-and-yang action happen as there was a great moment in Minnesota while the battle in St. Louis between the Jets and Blues certainly had a moment of shock when a guy who rarely scores found the back of the net in a most peculiar way! There is still some meaning to these remaining games for a few teams as you'll see tonight. First, we'll start in Minnesota where the hometown Wild decided to celebrate fifty years of pro hockey in the state by having the players take the warm-up ion the original 1967-esque Minnesota North Stars uniforms! 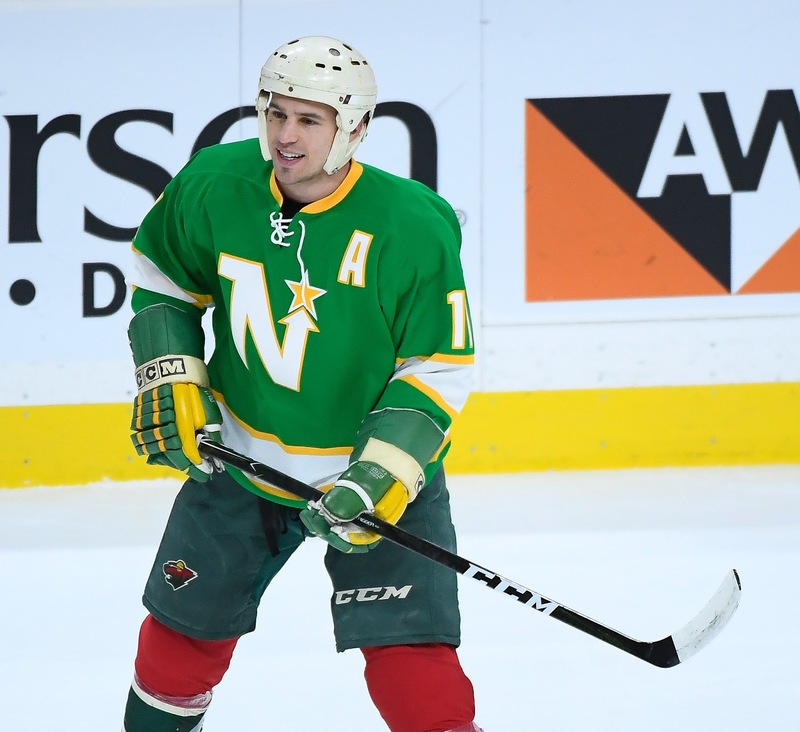 what turned this from a nice gesture into something special, however, was Zach Parise taking warm-up in his North Stars jersey while wearing his dad's helmet and gloves that he wore with the North Stars! 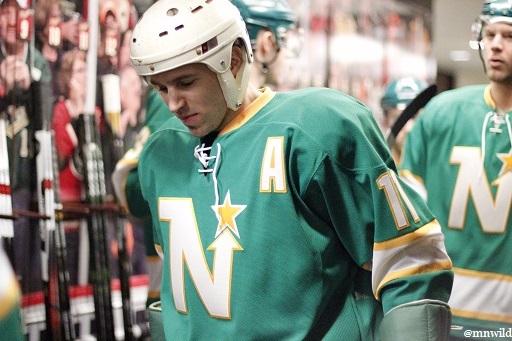 Zach Parise's father, Jean-Paul Parise, played for the North Stars from 1967 until 1975. He is one of the few players in NHL history to be dealt mid-season from an AHL club - the Rochester Americans - to an NHL club when Rochester traded Parise to Minnesota as part of an eight-player deal. Parise was a beloved icon in Minnesota during his playing days, and he returned to the state upon retirement to become an assistant coach with the club. He has a massive influence on hockey in the state as he took over the hockey program at Shattuck-St. Mary's prep school in Faribault, Minnesota upon leaving the North Stars, and turned the high school program into the premiere hockey prep program on the planet. Unfortunately, JP Parise passed away in January 2015 after succumbing to lung cancer, but his legacy will live on for generations for what he did for the sport in Minnesota. Zach's tribute to his late dad is definitely a highlight on this night, and I'll toss him a ton of kudos for honouring his father as he did tonight. Tonight also was a bit of a nightmare for Jake Allen in the St. Louis Blues' net as they hosted the Winnipeg Jets. Allen has struggled at times this year, but it appeared he was finding his form under Mike Yeo once again. Well, one of Winnipeg's noted "snipers" made him pay with a little bad puck luck. Mark Stuart, who had been healthy-scratched for a portion of this season, picked up his second goal of the campaign and 26th goal in his career off that ricochet to give the Jets a 3-1 lead in a game that they would go on to win by a 5-2 score. Stuart also added an assist in the game for his first two-point game of the season. Stuart hadn't scored since January 13, 2017 when he added a goal in a 4-3 loss in Glendale to the Arizona Coyotes. Prior to that goal, Stuart hadn't found the back of the net since lighting the lamp on October 15, 2015 in Madison Square Garden in a 4-1 win against the Rangers. In fact, since the Jets moved from Atlanta to Winnipeg, Mark Stuart has scored 12 goals total for the Jets. Of those goals, nine have been on the road with Arizona and New Jersey being victimized twice. I'm not saying anything negative about Stuart or his goal-scoring prowess, but 75% of his goals come in rinks other than MTS Centre where he spends a ton of time. That can't feel good for Jake Allen. The Jets, meanwhile, have put together a five-game winning streak when matters least, so they're doing an admirable job at moving down the draft board. We'll see if that streak continues when they waltz into Columbus on Thursday looking for their first six-game win streak since moving to Winnipeg from Atlanta.